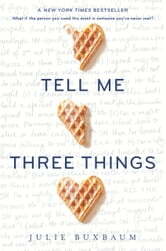 Three Reasons Why One Should Read Tell Me Three Things: 1. It is very well written. How easy it is to become completely immersed in this book as if one was the main character, Jessie Holmes', shadow! The characters develop thoroughly throughout this novel and the setting environment was brief, yet effective. The villain is offensive (as most villains tend to be) but this villain really got under my skin. I could feel the anger, the hurt, the embarrassment, and the desperate attempts at pride that Jessie felt. However, I could feel these emotions without having to go through paragraph after paragraph of regurgitating the same feeling, as can be the case in romances or YA fiction in general. These effectively communicated emotions are balanced with humor and symbolic themes. The most pronounced theme throughout the book was the number 3, which ended up being deeply rooted to Jessie Holmes' family. She was an only child, so it was just the three of them: Jessie and her parents. When she ends up having to move from Chicago to Los Angeles, she eventually forms a new group of friends and the group size is 3: Dri, Agnes, and Jessie. The third example (see what I did there?) of the value of 3 in this book is when Jessie has to choose between three (sort of) love interests. 2. Grief is used as a uniting force. Death isolated some of these characters' lives by robbing them blindly of loved ones and leaving their other loved ones damaged in it's wake. It separated them from others who had not been trespassed on by Death and suddenly family, friends, and acquaintances do not know how to comfort or even communicate with them anymore. On the other hand, those who have been branded by Death's pain can recognize it in others and empathize. It's what united not only Jessie's father and stepmother, but also Jessie and "SN". "SN" being an acronym for "Somebody/Nobody". Somebody who recognized Death's brand on Jessie because this person also had been attacked by Grief yet wanted to remain a Nobody to her and stays anonymous through most of the book. SN reaches out to Jessie in e-mail (and eventually IM) form with helpful hints about the school where Jessie is a new student. Not only has Death isolated her, but she is also isolated by being the new kid at (the very expensive, funded by her stepmother, and private) school and not many are friendly at first. In person, that is. However, with SN's guidance, she befriends Dri who then befriends her by association with Agnes and there, again, is another trifecta. This friendship and her new job at a bookstore slowly build her social life instead of only having to rely on SN and Scarlett, her best friend when she lived in Chicago. 3. When I read the last line of the book, I was giddy. Not only giddy, but eager to start the book all over again, for fun! This book had my inner high-schooler jumping for joy. Partially because of the many book references made in this book, but mostly because Julie Buxbaum captures what every high schooler went through/will go though: growing up. What every high schooler desperately wants yet genuinely fears. Some are forced into growing up through tragedies. Some through the damages caused by others. Some may never accept adulthood. But everyone is forced to attempt it at some point in high school. Jessie experiences pubescent self-consciousness, fear of her future, homesickness, fear of not knowing her place in the world, and difficulty expressing it all. She also finds out the hard way that life keeps moving on and things can never go back to the way they used to be. Pieces of her life do not fit anymore and the hardest part is figuring out what to do, if anything, about it. These are 3, out of many, reasons why I highly recommend this book. I may just re-read it 3 more times this year (probably while eating waffles). For those who may be offended: there is cursing, drug use, underage drinking, bullying, and very brief sexual comments. Please note: A copy of this note was generously provided by Penguin Random House through their First In Line program. Loved it! Really Sweet and Enjoyable YA Romance! Actual Rating 4.5 Stars Tell Me Three Things is such a cute and entertaining contemporary YA story. I burned through it pretty quickly, and had a hard time putting this one down when I had to do actual adulting. I really enjoyed the characters and romance, but I felt like the author did an excellent job dealing with the subject of grief as well. Several of the characters are dealing with the loss of a loved one in very different ways, which made the emotions more realistic and compelling. I found most, if not all, of the characters perfectly imperfect. Each had some issue or baggage, but again, that made them more likable and realistic. Being a teenager and navigating the gauntlet of high school is daunting, but throw in being the new girl at an ultra elite high school and adjusting to a new home life and it's downright terrifying. I loved watching Jessie shine (and stumble) her way through. I thought Theo provided some wonderful comic relief, but I also enjoyed the development of his bond and relationship with Jessie. Dri, Agnes, and Scarlett were great friends to Jessie and I liked how true Scarlett stayed to Jessie (even with the physical distance) and called her out when their friendship was strained. Ethan and Liam were both cute in their own ways, even though Ethan was more broody and dark at times. I was definitely rooting for one guy over the other, but both were good romantic interests for Jessie. Our mystery guy, Somebody/Nobody (SN), was adorable. I loved the playful back and forth between Jessie and SN and found myself grinning and smiling whenever they interacted. The fact that their relationship developed without anything physical actually occurring was refreshing and wonderful. I really enjoyed that they connected on an intellectual level and that their unconventional way of getting to know each other allowed them to be more frank and honest with each other. Although the book mainly revolves around finding out the identity of SN, it really wasn't that hard to figure out, which is why I didn't rate this book 5 stars. This fact didn't make the book any less enjoyable though and the author does try to throw you off the scent a few times. 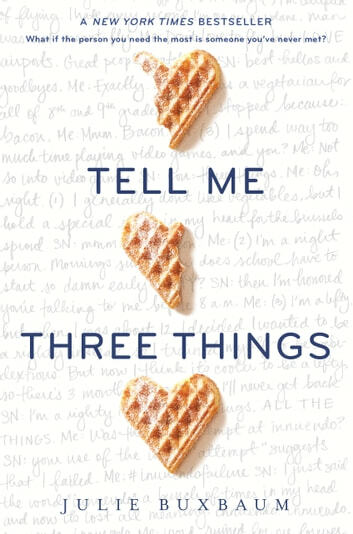 If you're looking for a funny and sweet contemporary YA romance, I definitely recommend Tell Me Three Things!